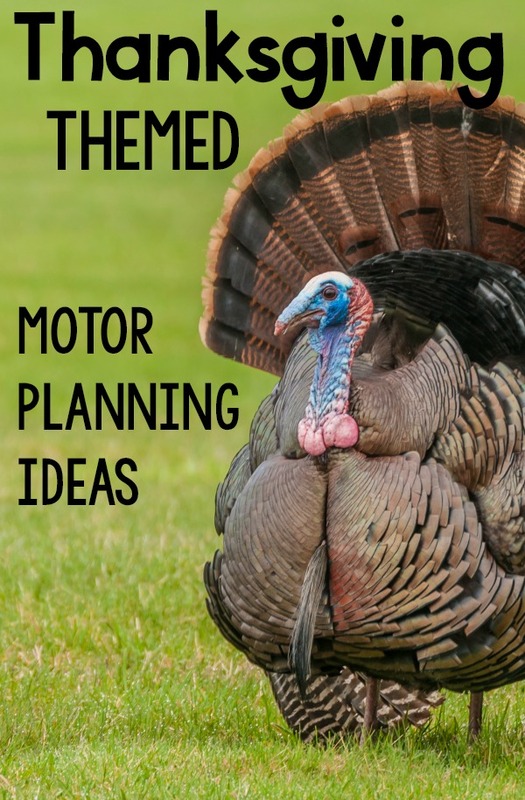 With Thanksgiving approaching it’s the perfect time to start thinking about Thanksgiving motor planning activities. I love Thanksgiving, I don’t like turkey, but I love that there are four days in a row that everyone in my family is home! We have several different fine motor and gross motor activities to do this year that all include a Thanksgiving theme. 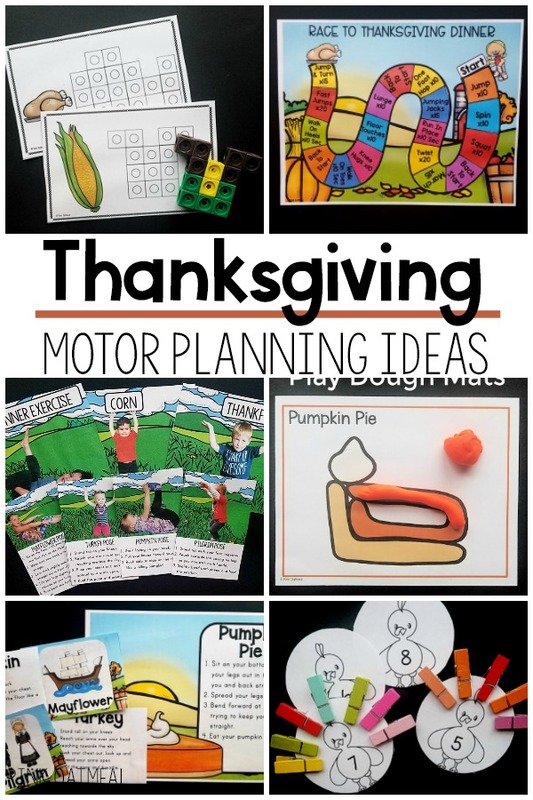 If Thanksgiving isn’t something you celebrate be sure to check out our Pumpkin Themed Motor Planning Ideas. These are also perfect for this time of year. The following activities are perfect for the month of November and especially fun right around Thanksgiving week. All of the activities are designed with physical activity and motor planning in mind! This fun and simple gross motor game is FREE for you in the freebie library. You need the printable, a paper clip, and pencil to create your spinner. 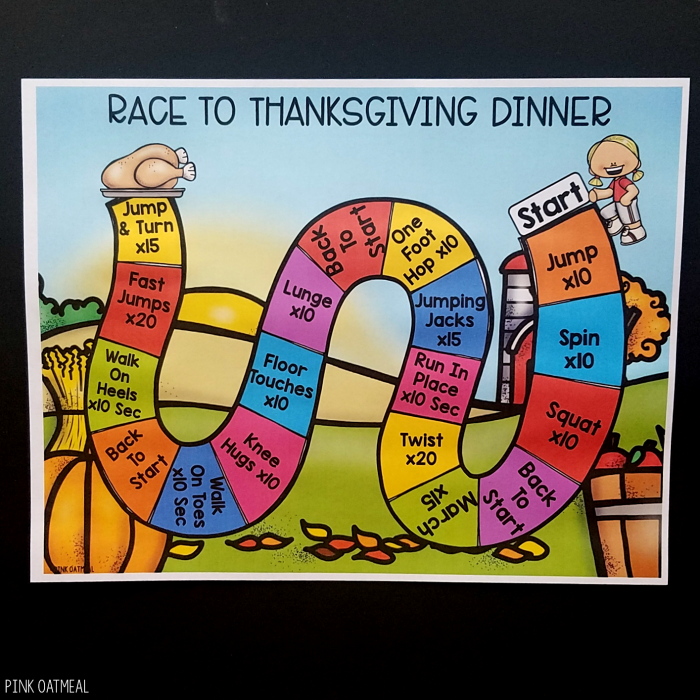 Spin and move with this fun Thanksgiving themed movement game. A fun and easy way to work on fine motor skills is by transferring poms to your favorite Thanksgiving themed objects. 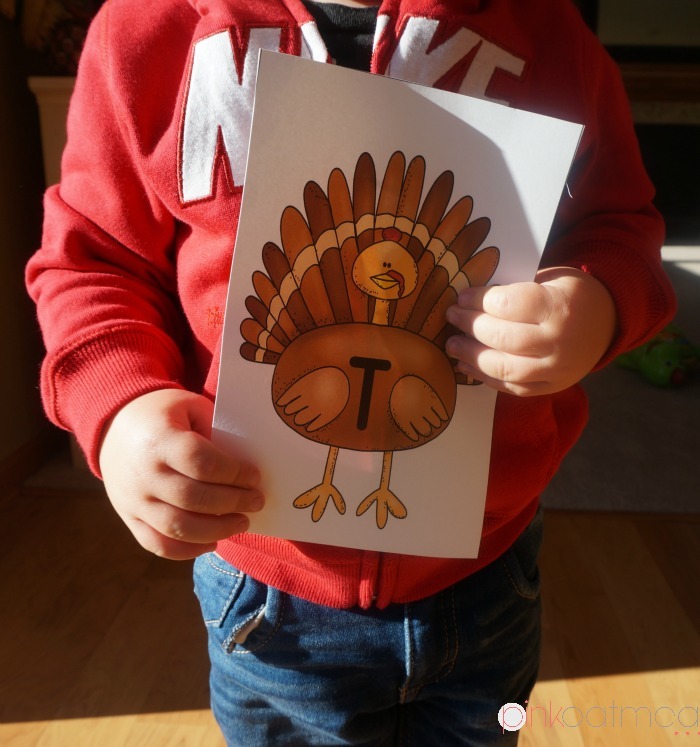 Use a tongs (affiliate) or fingers to work on this fun Thanksgiving themed fine motor activity. This is available for you in the Thanksgiving Themed Fine Motor Pack. The turkey trot is a fun way to add physical activity into your day. Race to spell the word turkey. Read in full about how to play the turkey trot game. This game is part of the Thanksgiving Themed Movement Games Pack. One of my favorite ways to work on fine motor skills. Thanksgiving themed snap cubes add to the fun this time of year. 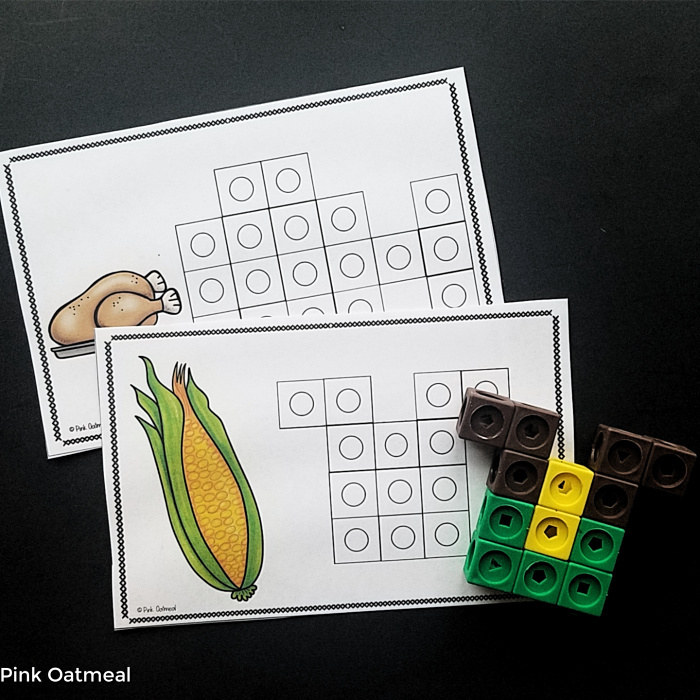 The snap cube patterns can be found in the Thanksgiving Themed Fine Motor Activities Pack. Another fun way to work on gross motor skills and physical activity is with yoga poses. Turning yoga poses into a Thanksgiving theme makes them more fun! Read about all of the different pose ideas. 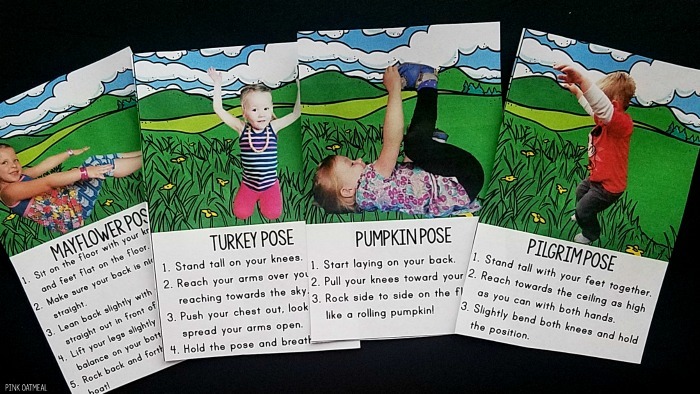 Get a set of Thanksgiving Yoga Cards in the shop – Kids Version or Objects Version. These are the same poses with a different presentation. 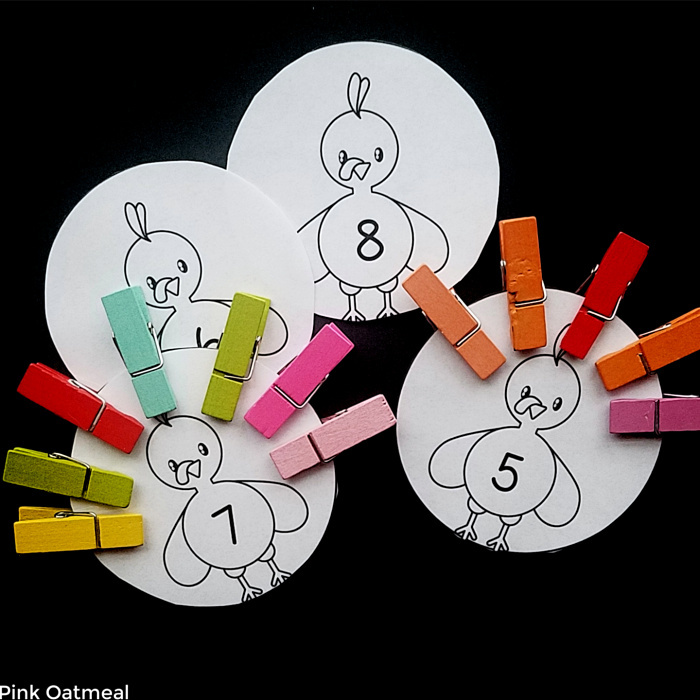 Create turkey feathers with this fun Thanksgiving themed clip game that works on numbers and fine motor skills at the same time. This game is available in the Thanksgiving Themed Fine Motor Pack. If you need something fast, fun, and effective for your kids for the month of November, Thanksgiving Themed Brain Breaks are for you! These are a fun way to add physical activity in November and at Thanksgiving. Read about all of the different ideas. Get a set of cards in the shop. Play dough is a fun and effective way to work on muscle strength for fine motor skills. 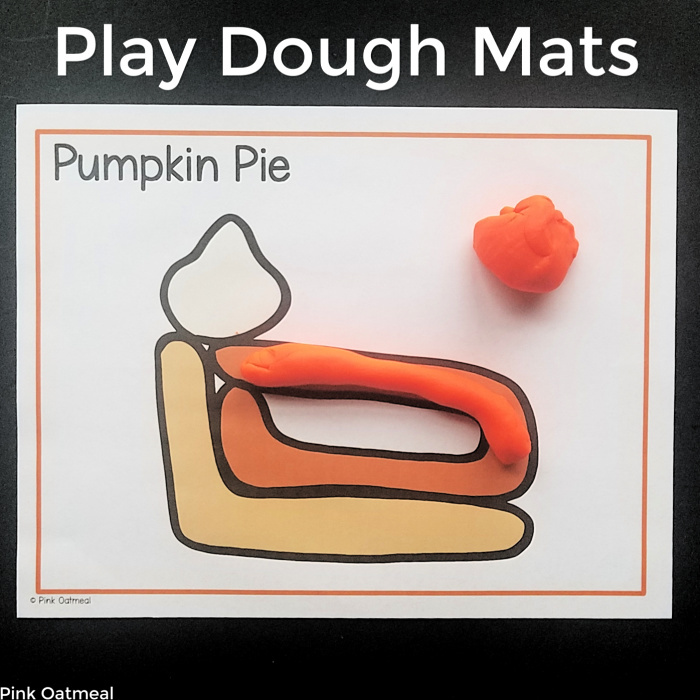 The thanksgiving themed play dough mats are perfect for this time of year. 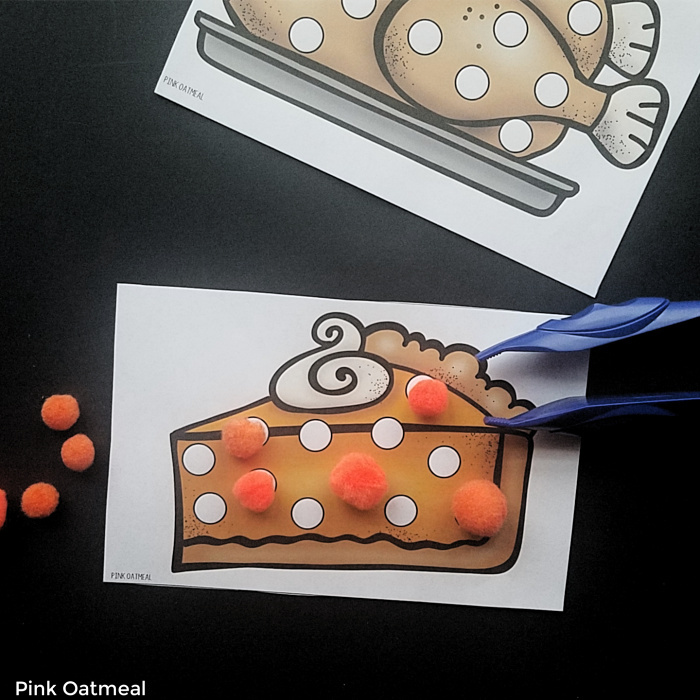 Find the Thanksgiving play dough mats in the Thanksgiving Fine Motor Activities Pack. This fun PowerPoint game is easy to play on your interactive white board or tablet and requires no prep. You must have PowerPoint to play. Click on the Thanksgiving themed object and move your body! Get the game for FREE in the freebie library. Pre-writing strokes are important and need to be in place before trying to work on actual letters. I like to laminate these pre-writing strips to use them over and over. Dry erase markers work great for writing. The Thanksgiving theme is perfect for this time of year. 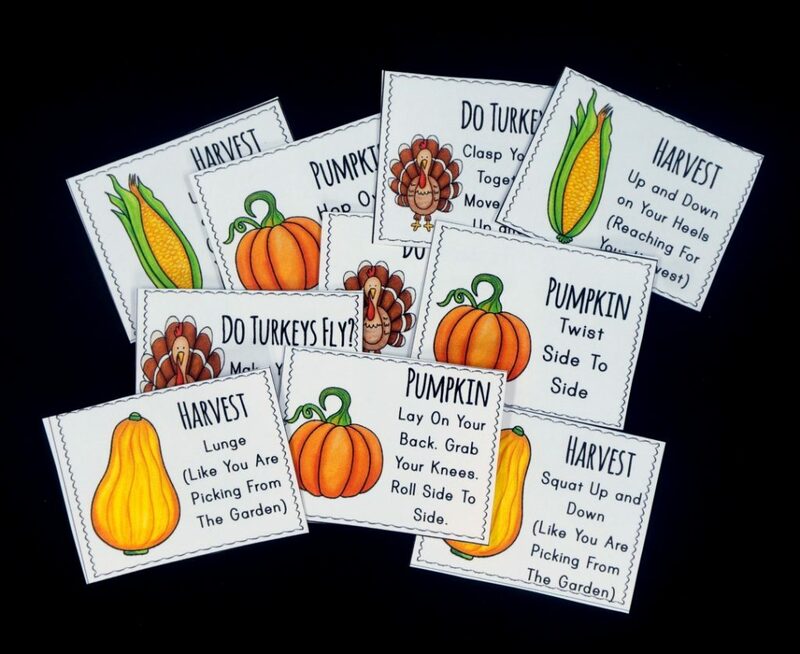 Get this and more in the Thanksgiving Themed Fine Motor Pack. 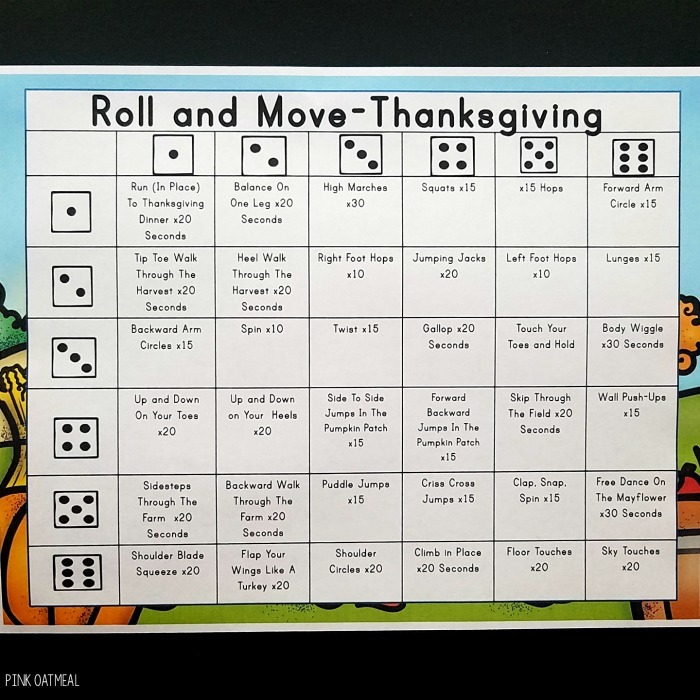 The roll and move Thanksgiving dice games are fun and easy. My five year old and his competitive side loves playing these games. The dice games and more can be found in the Thanksgiving Movement Games Pack. 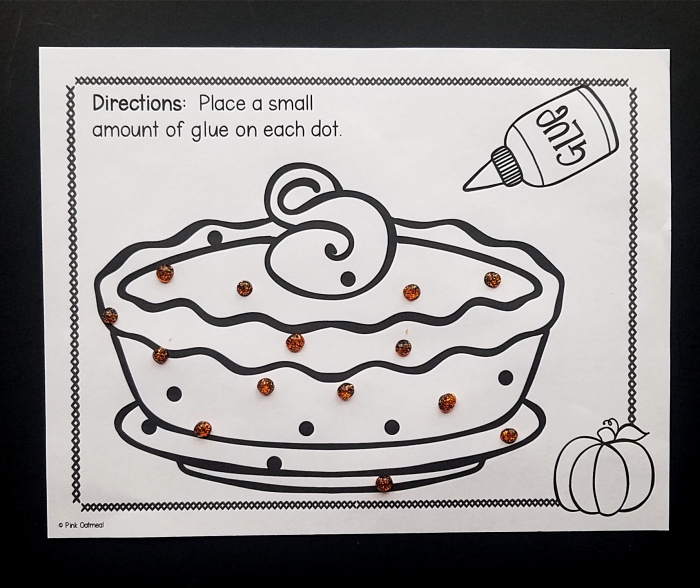 A great opportunity to work on fine motor skills and glue practice is with the Thanksgiving fine motor activities glue dots. Place little dots of glue on on the Thanksgiving themed objects. This can be found in the Thanksgiving Fine Motor Activities Pack. 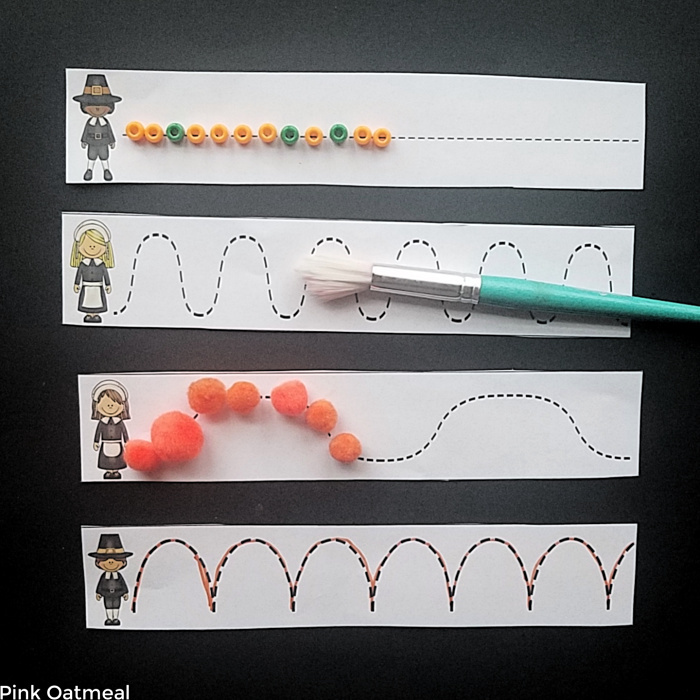 Another great way to work on fine motor skills with with pencil control exercises. The Thanksgiving theme makes it even more fun for the month of November. 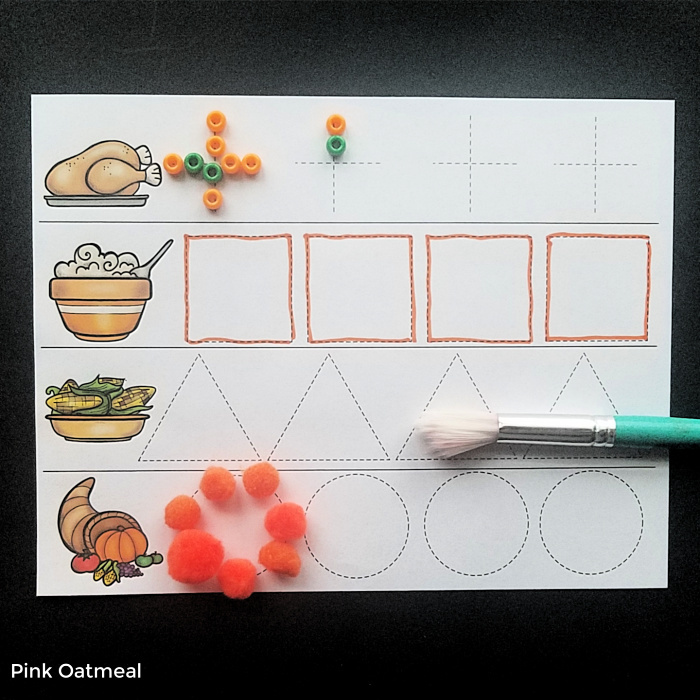 This Thanksgiving themed fine motor activity can be found in the Thanksgiving Fine Motor Activities Pack. If you want all of your Thanksgiving motor planning activities done for you, the easiest way would be to grab the Thanksgiving Motor Pack. 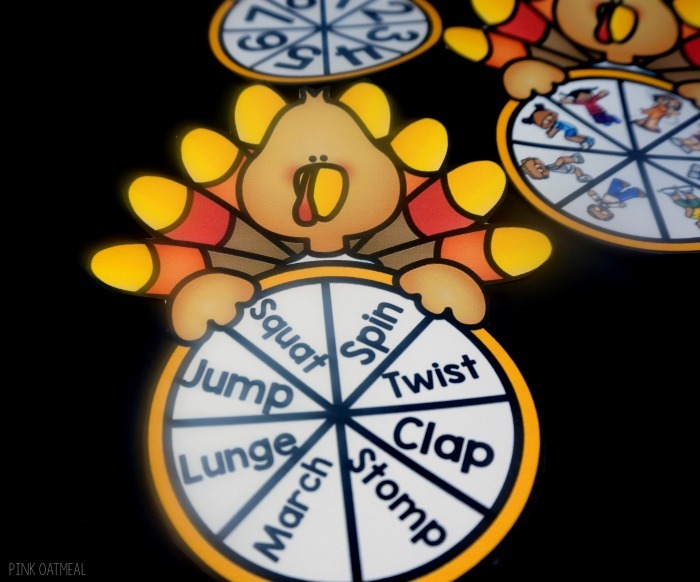 This pack consists of yoga, brain breaks, and fine motor activities all with a Thanksgiving theme. Because you are purchasing these activities in a pack you save money! Get this in the shop!